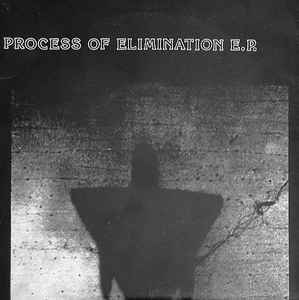 Various ‎– Process Of Elimination E.P. Third pressing with yellow labels and small center hole. "Maumee, OH" address printed on back cover. Includes two large inserts with lyrics, band pictures and updated band info & thank list. "Since the first pressing of this E.P. The Fix and Youth Patrol have broken up." No catalog appears on the release, info taken from the official Touch And Go web site. No mastering company and engineer credited, identified by the 'NR-13265' type runout etchings.